Anna Lindblad Trio plays traditional music from Annas home region of Västergötland on the Swedish west coast. Together with Annas own compositions, this trio makes an interesting contribution to Swedish contemporary tradition. With influences from North American roots music, this trio takes you on a musical trip where the tune has the focus, but playfullness play a big role. Anna is joined by Swedish cello wizard Anders Löfberg (Nordic, Majorstuen) and fiddle player Ryan Drickey (Finnders & Youngberg), an honorary Swede from Colorado. 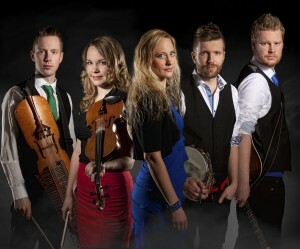 We play Scandinavian folk music, traditional and contemporary. We played together for the first time in 2011 in the notorious backstage bar behind Tønder Festival’s Tent One but it took us three more Tønder Festivals to get our act together and officially form a band. We found each other because we all like the different styles of Scandinavian traditional music, we have similar musical interests and get inspired by similar things. We play music we enjoy listening to, from the countries around Skagerrak, with a splash from the North Sea and the Atlantic Ocean. Skagerrak is the sea that connects our countries and in the old days it had a great influence on Scandinavia and our shared history, our similar languages, and our common mentality. We want to express this shared community through our music. 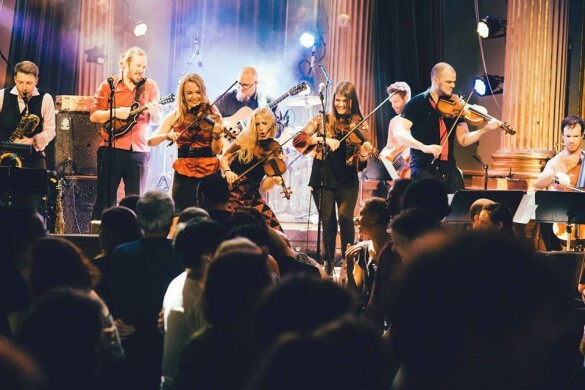 LYY – Swedish Folk Music that will soothe your mind, captivate your heart and rock your socks off! The folk pop band LYY was founded in 2006. Since then they’ve created music where the lyric sounds and the melody brings stories to life. Lyy’s repertoire consists of traditional music and self-penned material. All arrangements are performed with energy, preciseness and a good sense of humor. In 2010 Lyy released their self titled debut album and their second album “två” was released in the early summer 2012. A third album will be recorded and released during 2015 so stay tuned! Belgium, Germany, Canada, Scotland, Norway, Finland and Denmark are some of the countries Lyy has visited with great success, a part from concerts and workshops in Sweden. Please visit www.lyy.se for more info, music, photos and videos! Anna is one of the fiddlers in the powerhouse big (folk) band FAB, Folk All-in Band. Besides fiddles, cello, guitar, mandolin, piano and percussion, the band also features saxohones, trumpet and trombone. Prepare to be blown away and forced, by your own two feet, to enter the dance floor. This is trad-disco at it’s best – acoustic! Anna teaches both indivudual private fiddle classes and group workshops. She has taught at various fiddle camps; Haapavesi in Finland, Alasdair Fraser’s Crisol de Cuerda in Spain, and Nordic Fiddles and Feet in New Hampshire to name a few. Please send an email with any questions regarding classes, workshops and camps. Ever since I was a child handicrafts has always inspired me. Me and my mother, Karin Lindblad, have started to make knited garments for sale, and you will reach them by clicking on the picture to the left. 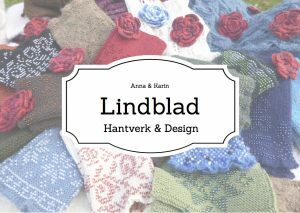 It will take you to Lindblads Hantverk and our page on Etsy where you can browse around and look at our products. We can also make custom orders, just send us an email at info(@)annalindblad.se for more information!